Published by breathmint on April 16, 2011 in Concert Recordings, FLAC and mp3. 0 Comments Tags: Ottobar, The Mountain Goats. 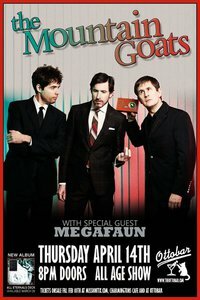 Here’s my recording of The Mountain Goats at the Ottobar on April 14, 2011. This show was all kinds of amazing. I will let the recording speak for itself. Unfortunately, I had a recorder mic input issue which caused some loss of stereo in my recording. I have made a best effort to clean this up by replacing these instances with dual mono. In some cases I have removed portions of the audio. The vast majority of this (luckily) occured in between songs. Overall, the audio quality is excellent. This show may not be sold under any cirumstances.